The Plunge in Mission Beach’s Belmont Park is one of San Diego’s most famous parks and has more than 91 years of history. OpenAire has started construction on a 29,330 square-foot transformation which includes an aluminum-framed retractable roof enclosure for the indoor swimming pool at The Plunge. This new curved glazed roof installation measuring 104’ x 204’ in length with glass sidewalls over 39’ high is expected to provide a sunny haven as an extension of the popular beachfront. This structure has 10 large retractable roof panels with two glass overhead doors and motorized pivot windows. When these are opened, cool ocean breezes will flow right through the building. With the push of a button, indoor comfort is guaranteed as well. 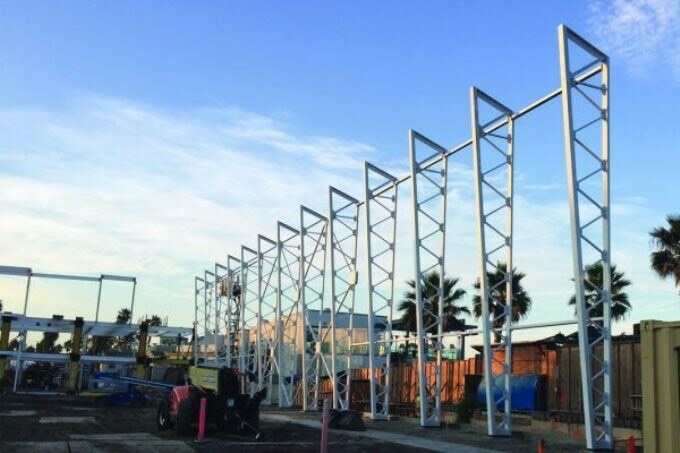 This structure will also include a newly built, 25-foot-wide two-story mezzanine along its 204-foot length. This will provide a pleasing atmosphere for swimmers to train or relax while overlooking the pool in one direction and incredible ocean views in the other. The renowned Plunge swimming pool was closed for modernization in 2016. This project was undertaken when it came to the notice of the authorities that the structure’s steel frame was highly corroded and needed large-scale renovations. The new freestanding enclosure from OpenAire provided a perfect solution to this problem, since its corrosion-resistant materials can withstand the swimming pool’s humid aquatic environment and the oceanside air outdoors. The roof enclosure will also be connected to the newly built FIT Athletic Club which is located next to it. This will be achieved by using a flat roof section that has been designed in association with the architects of the FIT Athletic Club so that users can enjoy easy access between these two facilities. This project’s lead developer, Pacifica Enterprises, and OpenAire are striving hard to ensure that the Plunge’s unique hallmarks are preserved throughout the modification. The swimming pool’s floor will feature tiles that reflect the original design, while the renowned Wyland whaling mural will be fully remodelled for visitors to enjoy. The project is expected to be completed by the summer of 2018. OpenAire is thrilled to be associated with the restructuring of this San Diego monument and is looking forward to return this splendid masterpiece to its inhabitants.